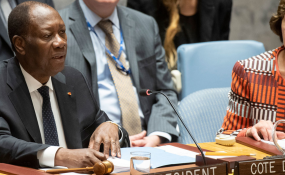 Côte d’Ivoire President Alassane Ouattara, left, who is President of the Security Council for the month of December in 2018, chairs a meeting on peacebuilding and sustaining peace. "Peace and development are indivisible," UN Secretary-General António Guterres told the Security Council on Wednesday, encouraging a stronger push along what he dubbed "the peace continuum" as the "best guarantee against instability and insecurity." At a debate on peacebuilding and sustaining peace, the UN chief explained that both the human and financial costs in responding to the prolonged crises shaking today's world are "too high," and that there needs to be a refocus on prevention and coordination activities between "the three pillars of peace, sustainable development and human rights." "Peace cannot be sustainable without development, and lasting peace is essential for the preservation of development gains," Mr. Guterres continued. He spelled out that this requires a holistic approach. "Essentially, this approach assumes that we are fighting against potential factors of instability, such as inequality, climate change competition for resources corruption and cross-border crime," stressed the UN chief, underscoring the need to invest in basic services, sustainable development and social cohesion as "investing in peace." To ensure lasting peace after a violent conflict, he maintained that the UN presence must be more adaptable in prioritizing the country's needs and in mobilizing the UN system, including "all peace operations, all humanitarian and development actors," which his reform agenda outlines as "fundamental." He also underscored the need for more inclusive approaches so that "peace and development activities are owned, and led by national local actors," including women, the elderly, youth, those with disabilities and minority groups. "Women's participation, in particular, is a sure way to improve the effectiveness and sustainability of peacebuilding," he argued, calling their contribution "crucial" to economic recovery, political legitimacy and social cohesion. Embrace a holistic approach that addresses potential triggers of instability. Adopt more inclusive approaches, led by national and local actors. Forge partnerships to safeguard development gains, and build local capacities to prevent and respond to conflicts. Ensure adequate resources for peacebuilding and development during conflict. Mr. Guterres also reaffirmed his commitment to strengthen partnerships with regional and sub-regional organizations, and international financial institutions, which he called "particularly important in transition settings." Recapping the UN's work in this area, he cited a deepened partnership with the African Union on development Agenda 2063, joint gender equality missions and a Strategic Partnership Framework with the World Bank toward a joint Pathways for Peace study. "We must support the mobilization and the mobilization of foreign investment," stated the UN chief, urging greater support for the Peacebuilding Fund, which provides crucial assistance in often overlooked remote areas. Mr. Guterres thanked Côte d'Ivoire President Alassane Ouattara, who chaired the meeting, for using his country's presidency of the Security Council during the month of December to table the topic. He also commended that State's movement towards consolidating peace and development, noting that in hosting a UN peacekeeping operation, "Côte d'Ivoire can indeed make a valuable contribution and share its experience with peace operations under way in other countries of the world."